Metastatic estrogen receptor (ER)-positive breast cancer responds well to anti-ER therapies, but eventually resistance occurs and the drugs fail to work. A new study presented at the 2018 American Association for Cancer Research meeting suggests that HER2 mutations can be acquired during metastatic cancer and their development represents a previously unreported mechanism of resistance to treatment. This resistance can be overcome by the irreversible HER2 inhibitor neratinib (Nerlynx). This study is preliminary, but it holds promise for the treatment of some patients with metastatic ER­positive breast cancer. Further study is needed to determine what percentage of patients with ER-resistant metastatic breast cancer acquire HER2 mutations, as well as to establish whether the combination of neratinib and fulvestrant (Faslodex) is effective or whether a different strategy is needed. “Resistant ER-positive metastatic breast cancer remains the most common cause of breast cancer death. Although ER-directed therapies are highly effective, most patients invariably develop resistance and stop responding to these drugs,” said co-lead investigator Utthara Nayar, PhD, Research Fellow, Department of Medical Oncology, Dana-Farber Cancer Institute, Boston, who presented the study. A recent mechanism of resistance to aromatase inhibitors by activating ER mutations has been identified in approximately 25% of patients, but mechanisms of resistance against other ER-directed therapies in other patients remain to be determined. “HER2 mutations may serve as an alternative mechanism of resistance. Unlike ER mutations, which confer resistance to aromatase inhibitors, HER2 mutations conferred resistance to multiple forms of ER-­directed therapy in ER-positive metastatic breast cancer,” she said. 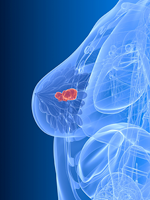 The study was based on whole-­exome sequencing of tumor biopsies from 168 patients with ER-positive metastatic breast cancer that developed resistance to hormone therapies, including tamoxifen (Nolvadex), fulvestrant, and palbociclib (Ibrance). HER2 mutations were found in 12 patients, and 8 of those had previously been identified as activating mutations. Further biopsies from the remaining 5 patients revealed that 4 patients had no evidence of preexisting HER2 mutations, suggesting that these activating mutations were acquired as a response to pressure from ER-directed therapy. “It was surprising to discover that HER2 mutations can be acquired in the metastatic setting, suggesting that these tumors evolve, and these mutations seem to be a mechanism of resistance to therapies that target the estrogen receptor,” said senior investigator Nikhil Wagle, MD, Deputy Director, Center for Cancer Precision Medicine, Dana-Farber Cancer Institute. Laboratory studies showed that HER2 mutation–mediated resistance to hormone therapy could be overcome by the combination of fulvestrant plus neratinib. This strategy was also effective in 1 patient who received the combination. This study’s early results suggest that dual treatment with these drugs may be a novel strategy for patients with metastatic breast cancer and acquired HER2 mutations that is resistant to ER-directed therapies.